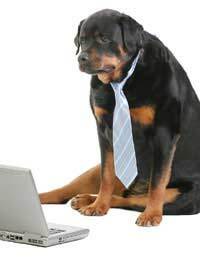 Apart from the National Take your Dog to Work day it is becoming more common to see dogs in the workplace. If you are thinking of taking your dog into your workplace there are several points to remember before packing his lunchbox and setting off. When you first purchase your new puppy you must realise it cannot head out into the wide world until he has had all of his vaccination shots. When your vet tells you it is OK to take him out then consider letting him accompany you to work. Puppies need a lot of attention, they will not be house trained and will not be too pleased to be left alone in a cage while you go to meetings or meet clients. Neither should puppies be handled too much by your colleagues. Instead they should have a routine and you should follow it as well. Perhaps wait until he is older. Puppies are not really happy in the workplace. It is quite often seen for assistance dogs to accompany their owners into work. These dogs are a marvel to watch as they act as eye, ears or hands for the disabled enabling them to carry out many daily routines at home and at work. If your colleague has an assistance dog ask them how they wish you to treat the dog. These dogs are highly trained and cannot, like normal pets, be distracted from their duties. However they are allowed some leisure time and you may be able to help in that way. When your dog goes to work with you he will need a place to sleep and call his own. He will need a familiar water bowl and also a bowl for his food. You must also have permission from your boss to be able to take the dog outside for exercise and to do his business. Remember to be a good dog owner and pick up after him as well. Your car journey into work should mean that the dog is secure in the car either wearing a seat belt or in a cage designed for dogs. If you are carrying puppies they should be secured in a cage or crate throughout the journey in case they are injured if you need to brake suddenly. Carry wet wipes and towels in case of accidents and never leave the dog in your car alone at any time. He may overheat within minutes, he may be stolen or he may get bored and chew the interior. Your dog must have impeccable behaviour if he is to visit your work place. Not everyone is a dog lover and it would be a shame if you were told to take him home if he were to be naughty. It could also cause your boss to stop any other dog owner from taking his dog or puppies into work. Take your dogs and puppies to training classes as soon as they are old enough. This will start with puppy socialisation classes and then obedience or other training clubs for dogs. Quiz: Are You Making Your Dog Neurotic?